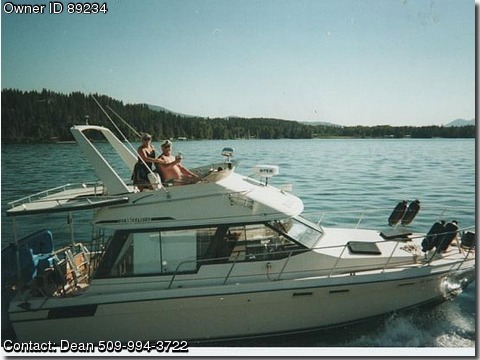 AM/FM Stereo/CD, 3 Automatic Bilge Pumps, Carpeting, Coast Guard Pack, 2 compasses, 2 Depthfinders, Dockside Power, Dual Controls, 2 Fishfinders, Battery Electric, Flybridge, Full Gauges, Galley, GPS, Halon, Hard Top, Head, Hydraulic Steering, Radar, Refrigeration, Shower, Storage, Stove, Micro, Swim Platform, Ladder, Trim Tabs, Triple Axle Trailer with Fresh Water Brake Flush Sysytem, 4 Batteries, 2 VHF Radios, Bow Pulpit with Windlass, Registered, Professionally Maintained, Toneau Cover for Flybridge, Full Removeable Mosquito enclosure. Professionally Applied 3 Part Epoxy Bottom. Complete Remodel of the Interior, Radar, Chartplotter, Pics on Request. Note: The twin Chevy engines were rebuilt in 2007.and they have only 87 hours on them since the rebuild.